These are very nice Teknion Leverage cubicles located in Atlanta, Georgia. 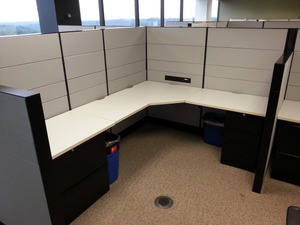 The cubicles are 50″ tall and come in a 6X6 or 6X8 configuration. A few of the panels have stackers included which would make them 58″ tall. Each used office cubicles comes with belt line power, either one file file or lateral file. Chat online today with questions.